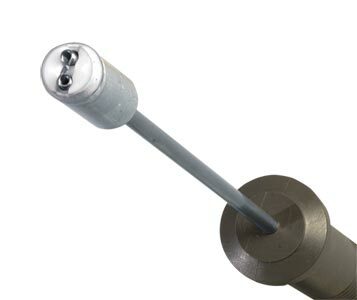 The spring mounted thermocouple tip ensures optimum surface contact and a fast response time. The comfortable, moulded handle, coiled cable which extends to 1.5 metres and mini plug make this probe ideal for use with handheld thermocouple thermometers. The sensor head is 9.5 mm diameter and 27 mm long, mounted on a 3 mm diameter stem for 150 mm long probes and 6 mm diameter for 300 mm. Probes with a 300 mm long sheath length are also available with a right angle (90°) bend approximately 70mm back from the tip. The SPHT style probe is supplied with many of Omega's Infrared temperature indicators to use as a reference for establishing emissivity.